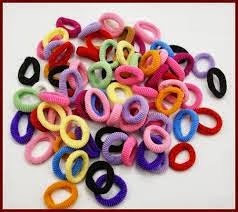 So my home is slowly being overtaken by teeny-tiny little colourful elastic bands, HOWEVER, I am getting concerned that these Loom Bands are basically the Grey Squirrels of the elastic band world, as I am SURE that they are slowly driving my hair bands out of existence. It doesn't matter how many trips to Primark I make, it doesn't matter how many hair bands I buy, they can be sparkly ones, they can be plain black ones, they can have bloody Disney princesses on them, (No, you shut up) they just seem to disappear into a dark abyss from which they can never be found. EVAH. I like to think that somewhere in my home there are a thousand hairbands having a massive rave. But the truth is that I JUST DON'T KNOW where they have gone. Are my hairbands the Red Squirrel? Slowly being pushed out by their hungrier and more aggressive grey relatives the Loom Band? Perhaps the Loom bands are overpowering my hair bands and flicking them out of the letterbox, or into the rubbish bin when I am not looking, All I know is that THEY AREN'T HERE. I cannot be the only one who has this problem, Are you also missing hairbands? Have YOUR hair bands ran off with mine? Or hod you know where hair bands hide? Perhaps Primark install homing devices in their bands that calls them back to the warehouse where they are repackaged and sold BACK TO ME. Seems like hard work to me, I'm off to primark to buy 700 for 30p. Yes! My hair bands always, always disappear. I tell you what doesn't though? Kirby grips. They get EVERYWHERE. I found a whole stash behind a curtain in the living room yesterday - they have a life of their own. You know I just checked behind my curtains, right? They have a life of their own and no matter how many you buy, within 24 hours you're down to only being able to find the one that is nextdoor to snapping. They are in league with teaspoons and conduct great escapes as soon as you turn your back on them. Ya mean bobbles right? I go through hundreds of the things, those and clips, millions of those!!!! Know I have a daughter I can only assume we will never have these things when we need them! !